The Last Ten Kilometer Project is implemented in 215 woredas of the four most populous regions of Ethiopia: Amhara, Oromiya, SNNP, and Tigray. In the Amhara Regional State, 9,552,505 people in 1709 kebeles of 78 woredas are L10K beneficiaries. The Amhara Development Association (ADA) is the only grantee implementing L10K project strategies in five zones of the region. The different L10K interventions are supported by different donors. In the Oromiya Regional State, L10K covers 3,707,583 people in 1,001 kebeles of 35 woredas. Sixty-four percent of those kebeles are accessible by road. The three Tier I grantees implementing the L10K project in 35 woredas of the Oromiya Regional State are the Oromiya Development Association (ODA), the Feyya Integrated Development Association (FIDA), and the Illu Women and Children Integrated Development Association (IWCIDA). ODA implements L10K project strategies in the 26 woredas in the East and West Wollega zones, as well as the Jimma and Illubabor zones; FIDA is present in four woredas of the Jimma Zone, and IWCDI is present in five woredas of the Illubabor Zone. In the Southern Nations, Nationalities and People’s (SNNP) Regional State, 4,752,140 people in 1039 kebeles of 39 woredas are covered by the L10K Project. Fifty-seven percent of these kebeles are accessible by road. The Silte Development Association (SDA) in Silte Zone. In four woredas (Konta and Yem special woredas and Mierab Abaya and Arbaminch Zuriya woredas of Gamo Gofa zone) L10K directly implements the Project’s activities. In the Tigray Regional State, 2, 730219 people in 420 kebeles of 20 woredas are beneficiaries of L10K. Seventy-seven percent of these kebeles are accessible by road. L10K has one grantee in the region; Relief Society of Tigray (REST). It implements activities in ten woredas of Central, Northwestern, and Southeastern Zones of the region. 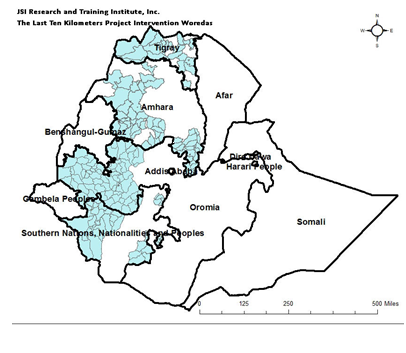 L10K directly implements activities in 5 woredas in Eastern, Central, Northwestern, and Southern Zones of the region. Bill and Melinda Gates Foundation supports 15 project woredas in implementing L10K platform activities. USAID supports eight project woredas in implementing expanded program on immunization (EPI). The L10K central office, based in Addis Ababa, is the leading entity and is responsible for the overall implementation of the L10K Project in Ethiopia. The central office works closely with the Ministry of Health (MoH) and provides technical and financial support for implementing the Health Extension Program. This includes developing training and BCC material; providing capacity building training to health workers (skills and tools); and piloting and scaling up innovative community based strategies to improve interaction between families, communities, health extension program and primary health care units. The central office is comprised of technical staff, including RMNCH, research, and communication experts, and a strong M&E team. Results and findings obtained from the various studies and surveys conducted by the M&E team are used in publications that highlight and discuss best practices and lessons learned from L10K project implementation. These findings and documents are shared with partners at multiple levels. The regional offices link with grantees and partners (i.e. regional/zonal/woreda health bureaus etc.) at the local level. The regional offices support L10K grantees implement project strategies, and ensure that sufficient focus is provided to project achievements.